My work wardrobe needs some refreshing, and I'm loving the look of pants in a fearless pop of cobalt blue. Ranging in shade from electric to deep cobalt, a strong impact in a pant elevates even a simple black and white sweater to a fashion statement. Don't stop at mixing cobalt pants withe black and white, they provide an awesome alternative neutral base for oranges, yellows, pinks, corals and emerald green as well. One of the best things about cobalt slacks is the wide variety in stores at the moment. I have my eye on this pair of silk stunners, but since I've been shopping, here are some other finds. There's a pair of Jenni Kayne cobalt pants that I'm dying for! Beautiful choice! Its practically a neutral, but with so much more life to it! 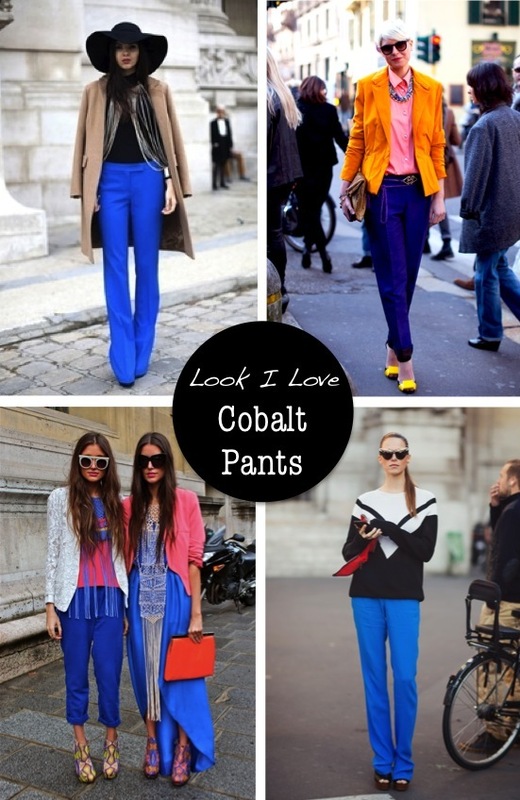 I love cobalt pants! I had my hands on a pair of these the other day and for some reason didn't buy them. Totally regretting that now! Loving colbat pants as well!!!!! Great blog; You've got yourself a new follower. I love love love everything about that first look!!! I'm loving fun colored or printed pants lately! I love the color personally, but the fit of a silk trouser drowns me ;( - I'll live vicariously through you when you purchase them- do an outfit post when you do! Yes, these pants are awesome. I personally love this color and even have some nice blue pumps! I think that will definitely make your work wardrobe pop. You can't go wrong with something blue that's for sure. It is definitely not hard to coordinate with. ah how bright! love the color! Absolutely love the color.. it's beautiful..
hi sweety, lovely blog and graphic, I'm your new follower! I love cobalt blue!! Thanks for posting some great finds!